Japan has released the BOJ Core CPI y/y, and Flash Manufacturing PMI and the US will publish Richmond Manufacturing Index, Flash Services PMI, Flash Manufacturing PMI, and HPI m/m. 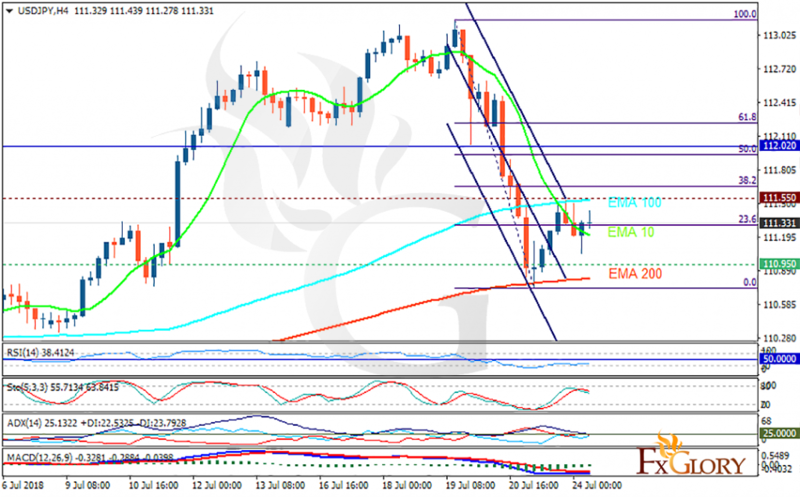 The support rests at 110.950 with resistance at 111.550 which both lines are below the weekly pivot point at 112.020. The EMA of 10 is moving with bearish bias in the descendant channel and it is above the EMA of 200 and below the EMA of 100. The RSI is moving below the 50 level, the Stochastic is showing downward momentum and the MACD line is below the signal line in the negative territory. The ADX is not showing any strong signals. The support level seems to be too strong to be broken therefore USDJPY may have started its correction pattern targeting the 61.8 level of Fibonacci at 112.2.